What decisions do you make on a daily basis? Do you let a bad mood ruin your day? Are you always finding what’s wrong, rather than what’s right? When things don’t work in your favor, do you find yourself beating yourself up? What if you didn’t? What if you could break the patterns that harm you, cause you unnecessary suffering, and replace them with patterns that move your forward? 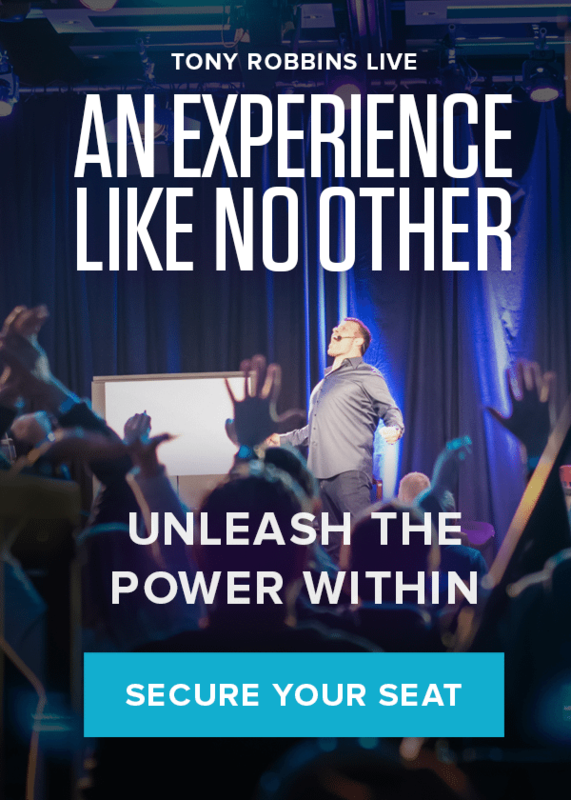 At Unleash the Power Within, you’ll learn to unlock and unleash the forces inside you to break through your limitations and take control of your life. An event like no other, Unleash the Power Within, is 3 ½ days where you will overcome your limitations and get on the path to success. Tony Robbins has devoted more than four decades to helping over 50 million people from over 100 countries around the world find their breakthroughs. His strategies have helped people like Serena Williams, Usher, Bill Clinton, and Hugh Jackman to identify and overcome their limiting beliefs. No matter where you are right now, or where you want to be, Unleash the Power Within is your chance to improve the most important areas of your life – physical health, relationships, career and personal finances. Discover the strategies to experience lasting energy and improved health. Master the powerful skills of rapport and influence to maximize your effectiveness as a leader, partner, business person and parent. Develop a clear target of what you want in your life and build a plan to achieve it. All in one life-changing weekend. Today, people demand instant gratification. They want results and they wanted them five minutes ago. So many people talk about wanting to create change in their life, but they aren’t willing to commit to what it takes to make those changes. If you don’t see instant results, you’re more likely to give up and move on to something else. But lasting change doesn’t happen overnight. You have to give up the idea of trying to make change and commit to it – by fully immersing yourself. Think about learning a language. If you want to learn French, you could take a night class once a week. You’ll probably pick up the basics after a few months, but not enough to be fluent. However, if you fully immerse yourself by going to France for an extended period of time, how fast will you become fluent? The same goes for achieving your goals. You have to be completely immersed in your goals if you want to achieve them. Unleash the Power Within is 3 ½ days of full immersion. 3 ½ days of you playing full out and committing to achieving any goal. No matter how successful you are, there’s a gap between where you are and where you want to be. Maybe your thriving in your career, but your relationships are struggling. Or maybe your health isn’t where you want it to be. It’s time to stop accepting the ordinary and start living your extraordinary life. Break through any limit and create the quality of life you desire and deserve at Unleash the Power Within!